Centre Stage Studios offers these dance programs. 6 yr olds with dance experience are in StageDebut. To make the transition from the combo class program into the 'big girls' program, the dancers will learn a baby ballet or baby jazz routine plus a lyrical or musical theatre routine during the year with more difficult choreography plus costumes. These 'StageDebut' will compete at one competition during spring. All Combo dancers will perform in different Christmas outfits like dresses, coats, sweaters and pants/skirts during the holiday season and then after Christmas, we will order costumes for the May recital. 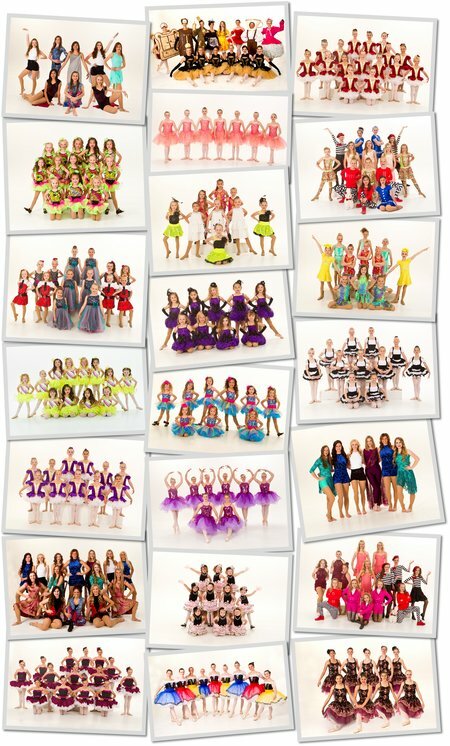 StageImpact do the same performances/competitions, but are a level up and one grade older than StageDebut – this year the ages are 2nd thru 3rd grade. Any style black leotard and pink tights, pink ballet slippers and tap shoes. Skirts allowed. Starting at age 6, ballet is offered in ballet technique shoes. We have ballet I, II, III and IV before the students are tested for pointe work at around 11 years of age. Ballet students have the opportunity to perform in the annual Nutcracker held the 2nd week in December at the King Fine Arts Center. Dress code is any style black leotard, no skirts, pink tights with feet in them, and pink ballet slippers, hair up in a bun with a hair net and bobby pins, or you may use one of the snoods in Premier Dancewear. Seamed tights for the pointe students. All ballet students will have the opportunity to audition for "The Nutcracker" going on its 23rd year and also be in a ballet for the May recital. Costumes will be ordered 1st lesson in January. Jazz pants (slim fitting), hot pants and tops – no school clothes please! Jazz gore boots, sole savers. Hair off the face. The class will focus on flexibility to get the oversplits, conditioning and dance 'tricks' like jumps, aerials, back handsprings, battement turns, etc., to include in our dance choreography. Shorts and T-shirts or convertible tights and leotards. The feet need to be bare. Tumbling is offered to students age 3 and up. Please wear bare feet to the class. $55 For Two Classes a Week or a Combo Class Plus 45 Minute Tumbling, Etc. $110 The Company (Flat Rate for The Company, includes extra Jazz and Nutcracker rehearsals.) Student Assistants May Get A Discounted Rate On Tuition. Note: All Centre Stage Company dancers are encouraged to pick up extra ballet technique classes at no extra charge under their group tuition rate. Count up how many classes you take as a family to determine tuition rates. All tuition is to be kept up to date. No student will be taught without tuition payment being made regularly. $15 late fee if tuition is not paid by the 15th of the month. Bounced checks will automatically go through Checknet which charges a service charge and goes on your credit rating. Liability Insurance due the first lesson of the year is $10 per student enrolled. We have a credit card machine accepting Master Card, Visa and Discover for you to use on any payments of tuition, costume, competitions and also store merchandise. All tuition is to be paid by the 15th of the month to avoid the $15 late fee. Consistent attendance is a must when learning a talent. Please make a goal to attend class 100% of the time and to be early to stretch before class. It's not the classes you take, but the lessons you don't miss! While we encourage you to see your child's progress, coming every week is both distracting to the students and the instructor. We suggest once a month for a few minutes. Please keep younger siblings from running around the studio while you observe. They are welcome to sit and watch videos in the lobby area. Parents: Please supervise your children!